Ancient text from Chinese, Egyptian and Biblical periods have each depicted the observable effects of long term alcohol misuse such as memory impairment, problems with gait and mobility as well as changes in personality such as insight, self-awareness and confabulation. Today, we use an umbrella term to describe the physical damage caused to the brain due to sustained alcohol misuse; alcohol related brain damage (ARBD). Research into the prevalence and cognitive recovery of ARBD is still in its infancy and is an area that academic literature often recommends for exploration. In the absence of more recent findings, recovery statistics from Smith and Hillman (1999) are still commonly cited by practitioners in the field when working alongside service users and their families. They suggest that cognitive recovery from ARBD can be measured in quarters – 25% make no recovery, 25% make minor recovery and another 25% make significant cognitive improvements. With abstinence and appropriate nutrition, the final quarter are said to make a full recovery from the cognitive deficits of ARBD. I’ve now worked alongside this service user group for nearly four years, and an activity that is commonly enjoyed is a game of pool. I help people settle into their new tenancies, sometimes within new communities, and an effective social outlet has always been to build initial engagement and rapport over such a game. However, I’ve come to realise there are other benefits to playing pool including the potential to act as a method of assessment. 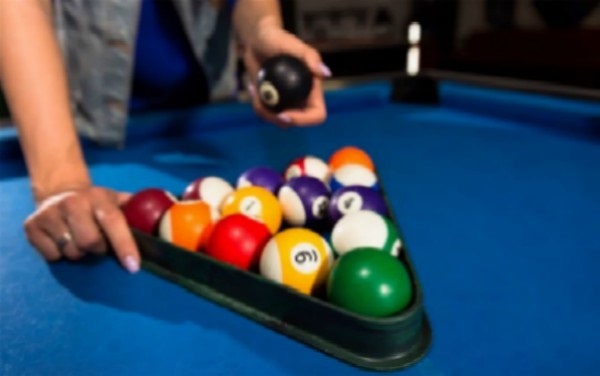 To initiate a game of pool, service users need to locate the correct coinage to insert into the table and this may involve exploring the contents of their wallet or pocket, operating a change machine or speaking to a cashier. Their numerical, executive functioning and social skills can be observed in this informal manner. The game itself involves each player focusing on their own set of balls and continuing to try to pot them until the game is concluded. From experience, I’ve noticed that people find it easier to differentiate between red and yellow balls, as opposed to striped and spotted balls with perception and reasoning deficits often notable. This could be due to easier differentiation between two plain colours as opposed to having to filter and distinguish balls with multiple colours, patterns and numbers on them. Remembering what set of balls to aim for can sometimes become more complicated as their set may change during subsequent games. If the service user consistently aims for an incorrect ball it sheds a little light on their sequencing and short-term memory abilities. Observing how someone moves around the table may highlight possible mobility problems with peripheral neuropathy and cerebellar ataxia common amongst the ARBD population. The initial game can set a benchmark in terms of observed mobility, with any notable reductions in the future suggesting possible continued alcohol use. Some people may need to sit down in between shots if they struggle to walk or stand unaided for any length of time. The venue may have music on in the background which might be an unwanted distraction for some, causing confusion and disorientation. To others, music from a certain era can act as a trigger to remembering specific periods of their lives and this can enhance the engagement and rapport building process during the session. Holding a pool cue and aiming a shot using their hands and fingers can occasionally highlight physical tremors that a person may be experiencing, and to the degree they are able to control them. This may indicate possible alcohol withdrawal symptoms although it can also suggest a person has neglected their nutritional needs and are ready for a meal. Collectively these subtle, discreet and unobtrusive observations can act as an informal assessment tool to gauge which ARBD manifestations are present. On some occasions, recovery has been noticed when a service user begins to better differentiate between the ball colours as the weeks and months go by, or when they are better able to manoeuvre around the table. Last year I supported a homeless gentleman who was hoping to make the transition from temporarily living with his brother to a place at one of our specialist ARBD supported accommodation services. As a recovery focused service, the referring psychiatrist had requested evidence of his ‘potential to acquire new learning’. I produced a report partly based on the progress I’d observed during games of pool spanning several months. The gentleman was offered a place and is now successfully continuing his recovery in our supported accommodation service. There is no known evidence base validating this unusual assessment technique, but I’m confident that it can’t do any harm as part of a practitioner’s toolkit.